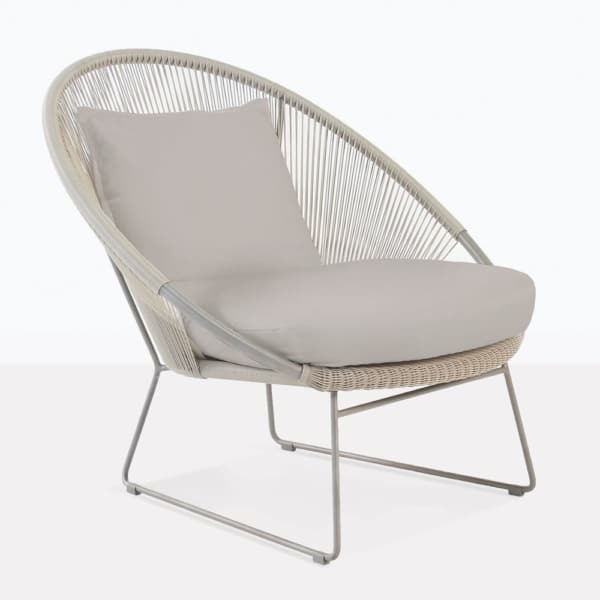 The Natalie Taupe Outdoor Lounge Chair will envelop you in a basket of comfort, while still giving you a perfect contemporary feel and look. The airy, open and contemporary weave made from Ecolene® outdoor wicker fiber is colorful, strong, built for comfort and longevity, and won’t fade or degrade in a variety of conditions. The Natalie Outdoor Loounge Chair is a perfect place to relax the day away, as the comfortable style ensures you don’t have to get up if you don’t want to. 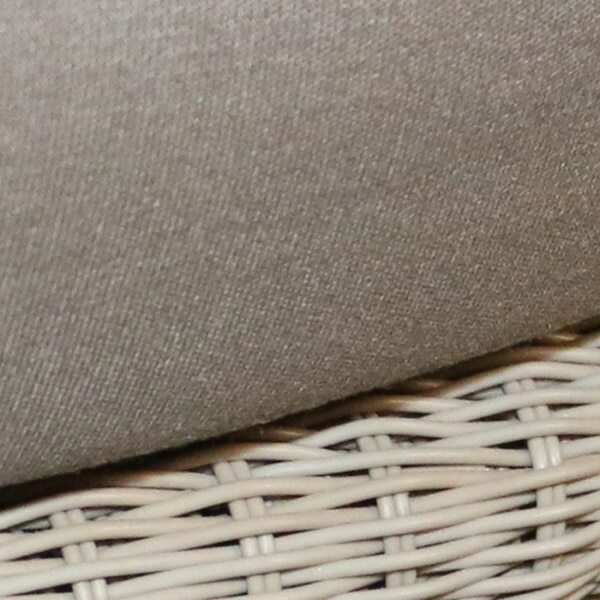 A “basket” made of aluminum and covered in gorgeous taupe Ecolene® fiber encompasses you for comfort, while a strong sturdy steel frame attached below, ensure you won’t ever have to worry about your chair flying away in strong breezes that occasionally come along. This relaxing outdoor lounge chair is strong and sturdy, but also remains light enough to easily be moved by anyone, so you can extract the last bit of sun out of every spring or summer day while enjoying the comfortable space the Natalie creates. 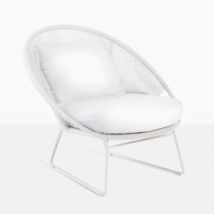 Made from a great set of complimentary materials, the Natalie Outdoor Lounge Chair incorporates Strong steel, lightweight Aluminum and beautiful Ecolene® outdoor fiber. The benefit of Ecolene® is readily apparent as you see it and experience it. The vibrant color palette is unlike anything you’ve ever seen before in outdoor wicker, with contemporary colors and fun shades, not to mention the occasionally bold colors. In this case, the taupe color is a compliment to nearly every earth tone and neutral enough to work with any sharp contrast, so you have a color that goes anywhere. Ecolene® is extruded High Density Polyethylene, a perfect fiber for outdoor conditions; it is also through dyed so your colors won’t fade or degrade over time. You’re truly getting a spectacular piece of outdoor furniture that’s fun, whimsical and built for the outdoors, no matter where you live, rain or shine. Teak Warehouse has a large offering of in-stock relaxing chairs, outdoor lounge chairs, wicker dining chairs, teak chairs and modern dining chairs. 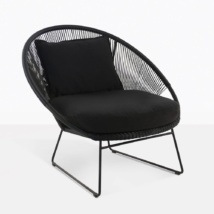 The Natalie Contemporary Outdoor Lounge Chair is only one option of dozens in its category. 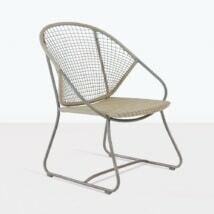 We offer such a wide array of outdoor furniture, all built to incredible standards. We offer commercial quality outdoor furniture to commercial buyers and residential consumers alike. Our styles have been featured in hundreds of publications and are used by professional designers and individuals around the world. We have many pieces from our outdoor furniture collection that are currently in use in resorts, spas, hotels, restaurants and public places. Our in stock selection has few competitors. Teak Warehouse is a premium outdoor furniture company, having been delivering top-quality outdoor furniture to a variety of clientele for two decades. We believe that our business model benefits the end user because we offer the best quality at the lowest prices. As the manufacturer and the seller of our furniture, we don’t need to over-inflate our prices to sell premium stock. We use only the finest materials in construction of our outdoor furniture, sourcing at the most sustainable and quality sources. We build and assemble and then quality check all of our furniture in the USA, at our Warehouses, and ship throughout the world, using a white glove delivery service. This means you don’t have to put our furniture together and finish it before you can use it. It also guarantees that you get furniture of the highest fit, finish and quality. Teak Warehouse has an in-stock guarantee: if you see it online at our website, we can ship immediately. We are also the only leading outdoor furniture company to include free cushions with our pieces as shown. No need to spend more money to get the comfort you expect from a top quality outdoor piece. If it’s shown with a cushion on site, it’s included as shown FREE. 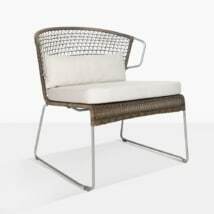 The Natalie Outdoor Lounge Chair in Taupe is a fantastic addition to any outdoor space, with the whimsy of the open weave, the strength of the steel frame, and the longevity and colorfastness of the synthetic outdoor wicker, this contemporary gem is ready to serve as your favorite relaxing chair, no matter where you decide to put it.